Microsoft Power BI Desktop has a native connector to perform direct query against HDInsight Interactive Query cluster. You can explore and visualize the data in interactive manner. To learn more see Visualize Interactive Query Hive data with Power BI in Azure HDInsight and Visualize big data with Power BI in Azure HDInsight. Apache Zeppelin interpreter concept allows any language/data-processing-backend to be plugged into Zeppelin. 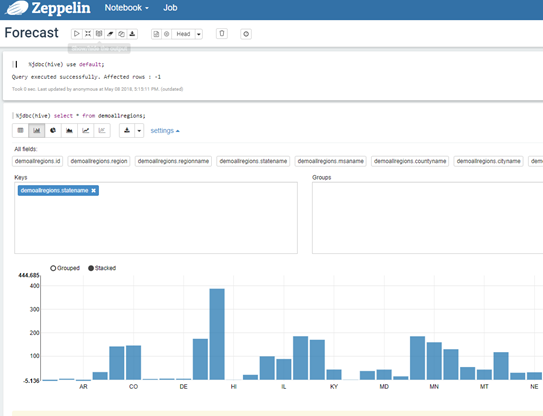 You can access Interactive Query from Apache Zeppelin using a JDBC interpreter. To learn more please see Use Zeppelin to run Hive queries in Azure HDInsight. With HDInsight Tools for VS Code, you can submit interactive queries as well at look at job information in HDInsight interactive query clusters. To learn more please see Use Visual Studio Code for Hive, LLAP or pySpark. 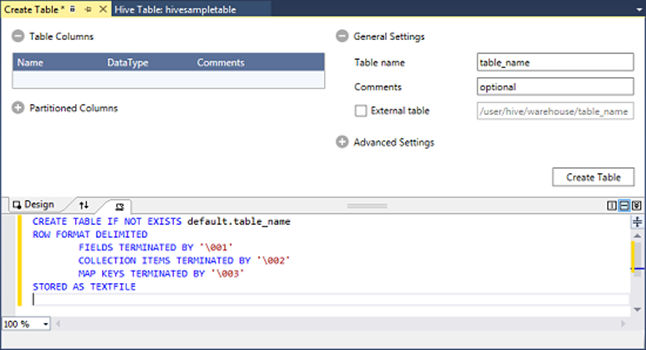 Visual Studio integration helps you create and query tables in visual fashion. You can create a Hive tables on top of data stored in Azure Data Lake Storage or Azure Storage. To learn more please see Connect to Azure HDInsight and run Hive queries using Data Lake Tools for Visual Studio. Write queries or browse query results in full-screen mode, which can be particularly helpful with complex queries or large query results. Manage query execution jobs and history. View existing databases, tables, and their statistics. Create/upload tables and export table DDL to source control. View visual explain plans to learn more about query plan. To learn more please see Use Hive View with Hadoop in Azure HDInsight. Beeline is a Hive client that is included on the head nodes of HDInsight cluster. 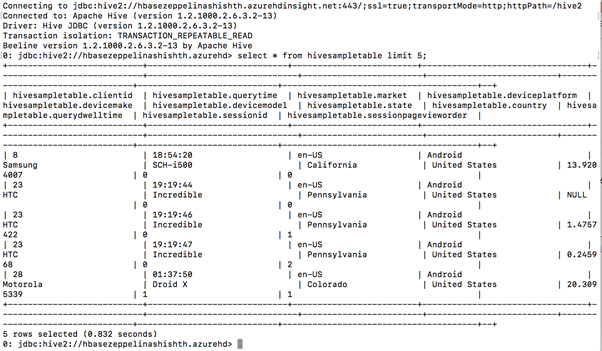 Beeline uses JDBC to connect to HiveServer2, a service hosted on HDInsight cluster. You can also use Beeline to access Hive on HDInsight remotely over the internet. 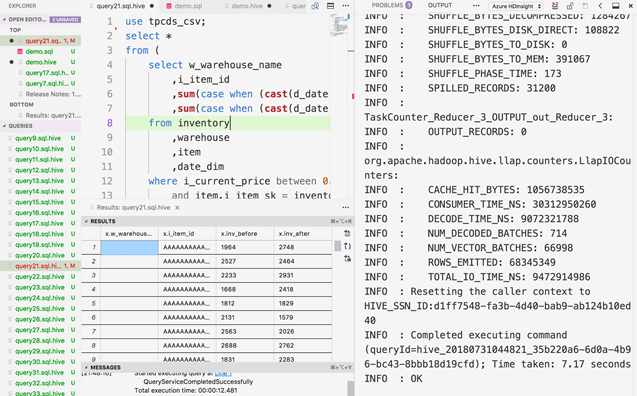 To learn more please see Use Hive with Hadoop in HDInsight with Beeline. 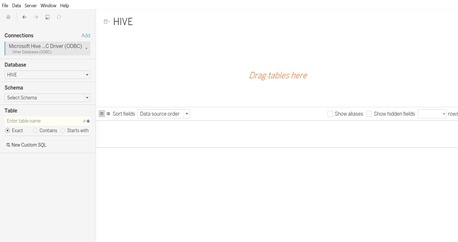 Open Database Connectivity (ODBC) API, a standard for the Hive database management system, enables ODBC compliant applications to interact seamlessly with Hive through a standard interface. 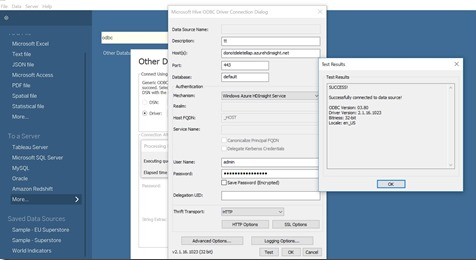 Learn more about how HDInsight publishes HDInsight Hive ODBC driver. Tableau is very popular data visualization tool. Customers can build visualizations by connecting Tableau with HDInsight interactive Query. Apache DBeaver is SQL client and a database administration tool. It is free and open-source (ASL). 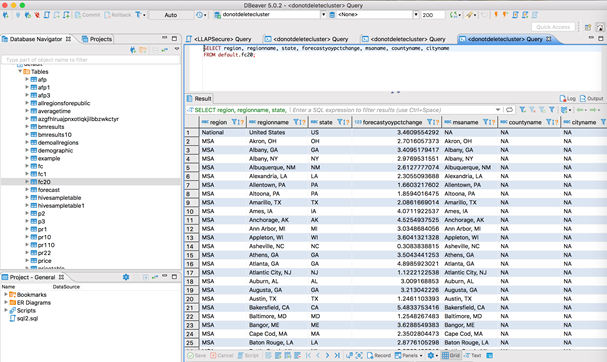 DBeaver use JDBC API to connect with SQL based databases. To learn more, see How to use DBeaver with Azure #HDInsight. Microsoft Excel is the most popular data analysis tool and connecting it with big data is even more interesting for our customers. 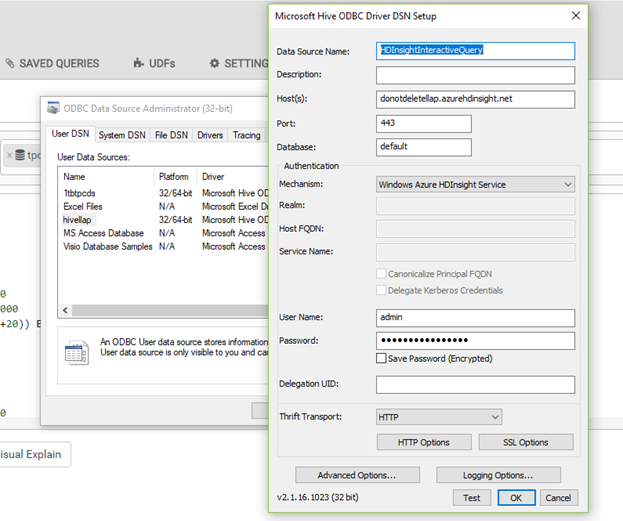 Azure HDInsight Interactive Query cluster can be integrated with Excel with ODBC connectivity.To learn more, see Connect Excel to Hadoop in Azure HDInsight with the Microsoft Hive ODBC driver. We hope you will take full advantage fast query capabilities of HDInsight Interactive Query using your favorite tools. We are excited to see what you will build with Azure HDInsight. Read this developer guide and follow the quick start guide to learn more about implementing these pipelines and architectures on Azure HDInsight. Stay up-to-date on the latest Azure HDInsight news and features by following us on Twitter #HDInsight and @AzureHDInsight. For questions and feedback, please reach out to AskHDInsight@microsoft.com. Get started with HDInsight Interactive Query Cluster in Azure. Zero ETL analytics with LLAP in Azure HDInsight. Azure HDInsight Performance Benchmarking: Interactive Query, Spark and Presto.